Created with a special high-quality tobacco that is blended and aged to perfection, GT's Pipe Tobacco delivers an exceptional smoke experience that is unique and fulfilling rich, with a slow satisfying burn that doesn’t render a harsh finish. 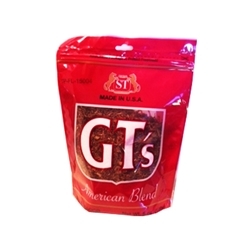 Offered here at our online tobacco store, GT’s Pipe Tobacco is best used packed and smoked straight from your favorite smoking pipe. Whatever is your smoking preference, GT’s Pipe Tobacco is priced perfectly as a smoker’s best friend. Each pouch of GT's Pipe Tobacco are available at our online tobacco store in unique styles to choose from. Full Flavor, Light, and Menthol.